Anticipated for months, Samsung's first Android phone is finally a (paper) reality after being flushed through the rumor mill just hours ago. Launching "in major European countries from June," the 11.9-mm slim quad-band GSM, tri-band 7.2Mbps HSDPA (900/1700/2100MHz) candybar packs a 3.2-inch, 320 x 480 pixel AMOLED touchscreen, WiFi, GPS, 5 megapixel camera with Power LED, 1,500mAh battery, 8GB of storage (plus MicroSD expansion for up to 32GB more), and a standard 3.5mm heasdset jack. Step aside HTC, you had your chance, let's all welcome Samsung to the Android party. Another picture and full press release after the break. P.S. Although no US announcements have been made, that 1700MHz HSPA frequency could make T-Mobile USA customers very happy. 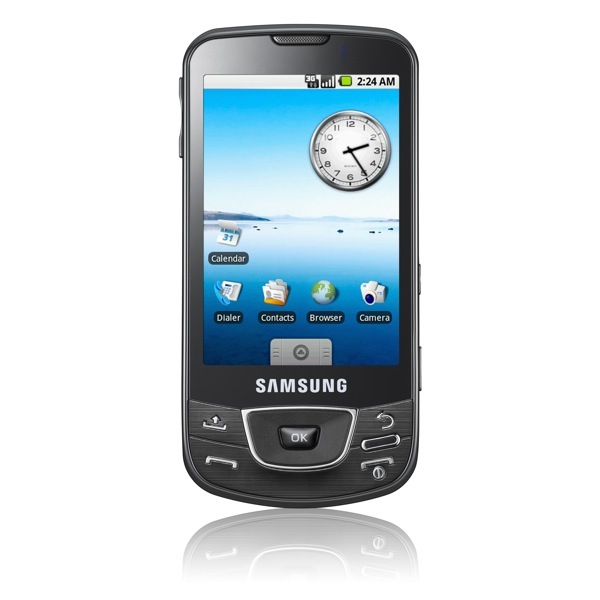 April 27, 2009, Seoul, Korea - Samsung Electronics Co., Ltd., a leading mobile phone provider, today unveiled the I7500, its first Android-powered mobile phone. With a launch of I7500, Samsung became the first company among the global top three mobile phone manufacturers to unveil an Android-powered phone. "Samsung is among the earliest members of the Open Handset Alliance and has been actively moving forward to introduce the most innovative Android mobile phone," said JK Shin, Executive Vice President and Head of Mobile Communication Division in Samsung Electronics. "With Samsung's accumulated technology leadership in mobile phone industry and our consistent strategy to support every existing operating system, I believe that Samsung provides the better choices and benefits to our consumers" he added. The Samsung I7500 offers users access to the full suite of Google services, including Google Search™, Google Maps™, Gmail™, YouTube™, Google Calendar™, and Google Talk™. The integrated GPS receiver enables the comprehensive use of Google Maps features, such as My Location, Google Latitude, Street View, local search and detailed route description. Hundreds of other applications are available in Android Market. For example, the application Wikitude, a mobile travel guide, allows consumers to access details of unknown sights via location-based Wikipedia articles. Based on Samsung's proven product leadership, Samsung I7500 comes with latest multimedia features. The large and vivid 3.2"AMOLED display ensures the brilliant representation of multimedia content and enjoyable full touch mobile experience. Along with supporting a 5-megapixel camera and various multimedia codec formats, the I7500 also provides a long enough battery life (1500mAh) and generous memory capacity up to 40GB (Internal memory: 8GB, External memory: Up to 32GB) to enjoy all the applications and multimedia content. The phone also boasts its slim and compact design with mere 11.9mm thickness. * Google, Google Search, Google Maps, Gmail, YouTube, Google Calendar, Google Talk are trademarks of Google Inc.